Biliary atresia (BA) is a neonatal cholestatic disease of unknown etiology. It is the leading cause of liver transplantation in children. Many similarities exist between BA and graft versus host disease suggesting engraftment of maternal cells during gestation could result in immune responses that lead to BA. The aim of this study was to determine the presence and extent of maternal microchimerism (MM) in the livers of infants with BA. Using fluorescent in situ hybridization (FISH), 11 male BA & 4 male neonatal hepatitis (NH) livers, which served as controls, were analyzed for X and Y-chromosomes. To further investigate MM in BA, 3 patients with BA, and their mothers, were HLA typed. Using immunohistochemical stains, the BA livers were examined for MM. Four additional BA livers underwent analysis by polymerase chain reaction (PCR) for evidence of MM. By FISH, 8 BA and 2 NH livers were interpretable. Seven of eight BA specimens showed evidence of MM. The number of maternal cells ranged from 2–4 maternal cells per biopsy slide. Neither NH specimen showed evidence of MM. In addition, immunohistochemical stains confirmed evidence of MM. Using PCR, a range of 1–142 copies of maternal DNA per 25,000 copies of patients DNA was found. Maternal microchimerism is present in the livers of patients with BA and may contribute to the pathogenesis of BA. Biliary atresia (BA) is a cholestatic disease of infancy characterized by the destruction of the biliary tree. [1–3] Both the intra-and extra-hepatic biliary ducts demonstrate evidence of a progressive destruction. This results in cholestasis, hepatic fibrosis and eventually cirrhosis. BA is associated with significant morbidity and mortality. Although the incidence of BA is 1 in 10,000 to 14,000 live births, [4, 5] it accounts for over 40% of the neonatal cholestatic liver disease in Europe and the United States. Prior to the hepatic portoenterostomy and liver transplantation, infants with BA had less than a 10% survival at 3 years of life and almost 100% mortality at 7 years of life. In the United States, it is the leading cause of pediatric liver transplantation. The etiology of biliary atresia remains unknown. Many hypotheses on the etiology of BA exist. Two leading hypothesis are that BA occurs as a result of ductal plate malformations occurring during development of the liver, or as a result of an immune mediated process triggered by yet to be determined stimulus. As more knowledge accrues about the histology and immunologic characteristics of BA, the more it appears to be a progressive immune mediated process. Given the similarities between BA and GVHD, we hypothesized that a contributing etiology of BA could be an alloimmune reaction such as in GVHD triggered by maternal microchimerism. Maternal microchimerism occurs when a small number of maternal cells are transferred to the offspring during pregnancy. This is known to occur in up to 40% of normal pregnancies. [15, 16] In addition, a clinical precedent of maternal microchimerism causing hepatic GVHD in children with severe combined immune deficiency (SCID) exists. The aim of this study was to determine the presence and extent of maternal microchimerism in the livers of infants with BA. This study was performed with the approval of the Committee of Human Research at USCF (H9048-20247-01). Cases of BA were identified through a data search in the Anatomic Pathology CoPath system by diagnosis or during patient medical visits to the UCSF Division of Pediatric Gastroenterology, Hepatology, and Nutrition. An explanation of the study was given to each study candidate. Written consent was obtained from each study participant. We modified a previously reported method of FISH,  using X and Y-chromosomes probes. Y-chromosomes were stained with a green fluorescent dye, fluorescein isothiocyanate (FITC). X chromosomes were stained with a red fluorescent dye, cyanine 3 (Cy-3). Nuclear material was stained with a blue fluorescent dye 4", 6"-diamidino-2-phenylindole (DAPI). After initial digestion and staining of the liver specimens, we examined the slides for evidence of female cells, depicted by two red signals, i.e. X chromosomes, with no green signal within the blue nuclear material. Slides were analyzed in a blinded fashion. Patients with BA and their mothers were HLA typed. The HLA typing HLA-A, -B, and -DRB1 alleles of the child and mother were determined by sequence specific PCR (SSP) (Pel-Freez Clinical Systems, LLC®, Brown Deer, WI, USA). Frozen tissues sections of BA patient's livers (5 μm) were fixed in acetone for 10 minutes at 4°C then washed in PBS (5 minutes centrifugation × 3). Sections were blocked with Protein Block (Dako, Carpinteria, CA, USA) for thirty minutes at room temperature. Sections were then incubated with anti-HLA-B14 mouse monoclonal antibody (US Biological, Swampscott, Mass. USA) then washed in PBS. Sections were incubated in goat anti-mouse conjugated with FITC for 30 minutes at room temperature. Sections were rewashed and then counterstained with DAPI. Slides were then examined using a fluorescent microscope. Using the HLA types of the patients with BA and their mothers, and a previously reported method of kPCR, evidence of maternal DNA was explored within the liver biopsy specimens of explanted BA livers. The minor modifications to the kinetic PCR protocol included use of iCyler from BioRad (Hercules, Ca, USA) for amplification. 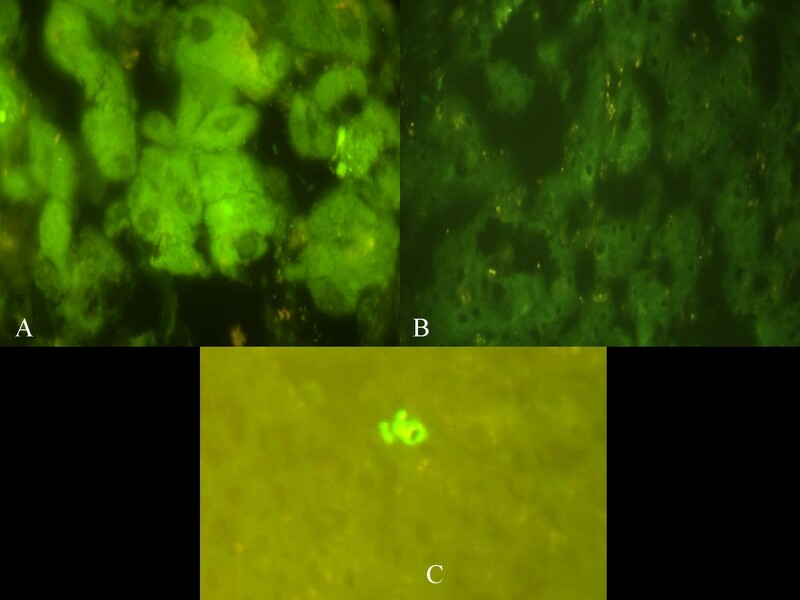 Using FISH, we examined 11 male BA liver biopsies and 4 male NH liver biopsies. After initial digestion and staining of the liver specimens, we were able to interpret 8 of the BA and 2 NH liver biopsy specimens (Table 1). Three BA and 2 NH biopsies underwent poor digestion and had no discernable signal. Figure 1 shows a liver from a male infant with BA. A male cell, depicted by a red signal, the X chromosome, and green signal, a Y chromosome within the blue nuclear material, clearly can be seen (A). In the same specimen, one can also see a female cell, depicted by two red signals, both X-chromosomes with no green signal within the blue nuclear material (B). 7/8 BA specimens had evidence of maternal microchimerism. The number of maternal cells, per biopsy slide, was 2 – 4 cells. Neither of the NH specimens had evidence of maternal microchimerism. 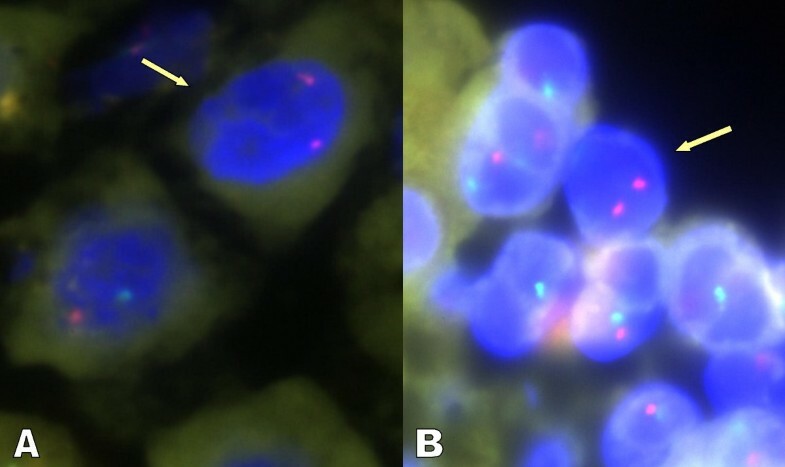 A male cell, depicted by a red signal, the X chromosome, and green signal, a Y chromosome within the blue nuclear material, can be seen in both male BA liver specimens (A&B). In the same specimen, one can also see a female cell, depicted by two red signals, both X-chromosomes with no green signal within the blue nuclear material (arrow). To further investigate our findings, three patients with BA and their mothers were HLA typed. Using the HLA marker B14, we examined the BA livers for evidence of maternal microchimerism using immunohistochemistry techniques. An HLA-B14 positive patient served as our positive control (Figure 2). Specimen B, our negative control, was a patient who was, along with his mother, negative for HLA-B14. Specimen C, our test specimen, was HLA-B14-, with an HLA-B14+ mother. Specimen A (positive control) has a bright signal for HLA-B14 while there is only background staining for HLA-B14 in specimen B (negative control). Specimen C, the test specimen, has isolated scattered bright signals suggesting maternal microchimerism. Using the HLA marker B14, we examined the BA livers for evidence of maternal microchimerism using immunohistochemistry techniques. An HLA-B14 positive patient served as our positive control (A). Specimen B, our negative control, was a patient who was, along with his mother, negative for HLA-B14. Specimen C, our test specimen, was HLA-B14 negative, with an HLA-B14+ mother. Specimen A (positive control) has a bright signal for HLA-B14 while there is only background staining for HLA-B14 in specimen B (negative control). Specimen C, the test specimen, has isolated scattered bright signals suggesting maternal microchimerism. Finally, using polymerase chain reaction, in conjunction with the HLA typing of patients and mothers, we were able to affirm that maternal microchimerism occurs in the BA livers. An additional four fresh frozen liver specimens of BA infants, obtained at the time of transplantation, were examined for maternal DNA. All the livers had evidence of maternal microchimerism, with the range of 1 to 142 copies of maternal DNA detected per 25000 copies of patients' DNA. Figure 3 is a representative kPCR for maternal HLA-B40 in the second liver sample. Representative kinetic PCR (kPCR) data for maternal HLA-B40 in BA liver sample. SYBR Green fluorescence is plotted on the y-axis as a function of amplification cycle number on the x-axis. 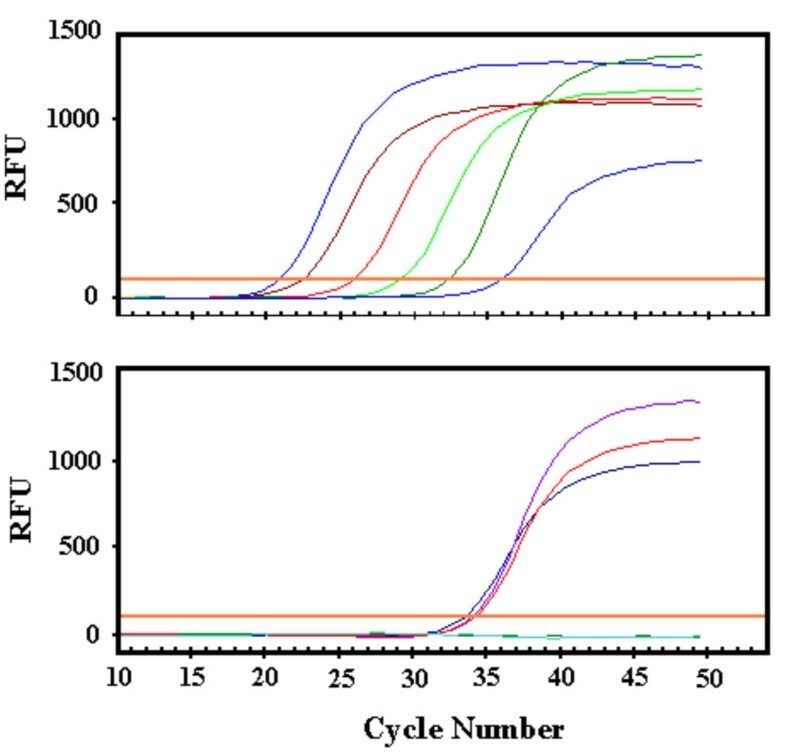 The upper panels depicts results for standard dilutions of HLA-B40 [left to right curves: 25000, 10000, 1000, 100,10, and 1 genomic equivalence (gEq)]. A single copy of template produces fluorescent signal after approximately 36 cycles of amplification. The lower panel shows results from three liver replicates and two negative (no-template) controls. The three liver replicates have a positive signals at 2–5 gEq, while the negative controls remained negative through 50 cycles. In all eleven of twelve patients with BA had evidence of maternal microchimerism by FISH or kinetic PCR, while neither of the two neonatal hepatitis patients had evidence of maternal microchimerism (p = 0.03). BA is a progressive cholestatic disease of infancy, which is characterized by a mild to moderate lymphocytic infiltration within the extra and intrahepatic bile ducts. It is plausible, that maternal microchimerism may play a role in the etio-pathogenesis of BA by causing an alloimmune reaction given the similarities between BA and GVHD. We have shown that maternal microchimerism is present within the livers of patients with BA. Maternal microchimerism occurs when maternal cells reside in the body of offspring. Maternal-fetal lymphocytic transfer is known to occur during pregnancy starting as early as the tenth week of gestation and continuing up to delivery. The number of cells that traverse the placenta increases throughout this period. Schroder et al  demonstrated that approximately 1/10 infants has about 0.07% maternal lymphocytes at the time of birth and more recent findings by Lo et al. have indicated the presence of maternal cells in over 40% of fetal blood samples. Maternal microchimerism is not a rare occurrence in healthy individuals, but is usually not associated with disease. The high occurrence of maternal microchimerism in healthy individuals has been suggested to have a tolergenic effect that may contribute to long-term microchimerism. Additionally, in utero transplantation of haploidentical cells does not always lead to immune tolerance  and may lead to immune sensitization. Thus, the immunological consequences of the migration of maternal cells to the fetus appear to be variable. In most cases the maternal cells are likely to be cleared by the host's immune system or they may escape destruction by the immune system leading to engraftment. Engraftment of maternal immune cells in the fetal biliary tract may result in an immune reaction against the host cholangiocytes. This is what we believe may occur in infants with BA. Alternatively, engrafted maternal cells in the fetus may subsequently be rejected by the immune system of the offspring, leading to destruction of the biliary tree. Maternal microchimerism occurs in the livers of patients with BA. Given the previously well-described relationship between microchimerism and GVHD, and the similarities between BA and GVHD, these findings indicate a potential etio-pathogenisis for BA. Further investigations into the role of maternal microchimerism in BA are warranted. The authors wish to thank Drs. Yuet Wai Kan and Robert Suskind for their support and helpful suggestions. The invaluable support of Rebecca PH Davis and Leslie Lewinter is also much appreciated. DLS conceived of the hypothesis and contributed to the design and coordination of the study; he also drafted the manuscript. PR and MBH participated in the design of the study and manuscript preparation. DK carried out the kPCR and HLA typing analyses. GM performed the FISH analyses. LBL carried out the kPCR and HLA typing analyses and participated in the study design. MOM participated on the study design and coordination, immunohistochemistry stains and the manuscript preparation.